If you live in Perth and you currently are dealing with trying to sell an old BMW, you are in luck. You get to be in the position to take advantage of having access to the services from us here at Perth Auto Wreckers. Our BMW Wreckers Perth team buys BMW’s all the time, no matter how old they are or what condition they happen to be in. And we pay top dollar for them as well! BMW cars have become synonymous with class and vehicular excellence, but that doesn’t stop them from breaking down. Sometimes permanently. This is why even BMW owners need to be able to sell junk cars. And we provide them with the means to be able to do that! When an old BMW breaks down for good, it is logical to think that it is now worthless. But it isn’t. If you would like to know how much your BMW can be worth, it is as easy as contacting us. The number you can call is 08 9452 8859. We also provide a form on our website to fill out if this is your preference. Both options involve telling us what model of BMW it is you want to sell, what condition it is in, and how old it is. Our Car Wreckers will get back to you as quickly as possible and provide you with a free quote, with no obligations attached. If you accept it we can move forward from there and make arrangements for us to come over and pay you cash on the spot. 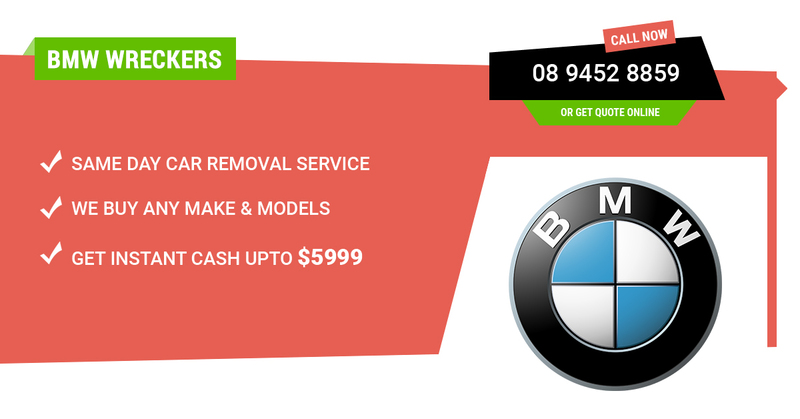 Free BMW Removal – Not just Perth city, we offer free scrap car pickup service across Maddington, Armadale, Rockingham, Mandurah, Belmont, Cockburn, Kwinana, Wangara, Osborne Park, Malaga and Joondalup. Our car removal service is free of cost and will always be free. Polite, Friendly and helpful customer service. We help our customers during the whole vehicle selling process including legal paperwork handling. Affordable high quality used BMW spare parts. We are probably the biggest dealer of second hand tyres and wheels when it comes to the availability. If you have an old BMW that has permanently broken down, totalled, unregistered, not running, fire or water damaged, mechanically faulty [Engine seized, Blown head gasket or transmission failure]and you want to sell it, our BMW Wreckers Perth crew will buy it off you. And if you have a BMW that works just fine, and you need fast money (moving overseas? ), we will buy that car fast. How else can you sell a vehicle in one day? Drop us a line!